He was a physician who was born in Segovia. His father was a converted Jewish doctor. 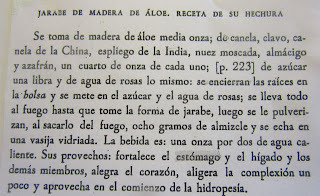 Andrés Laguna studied at the University of Salamanca for two years and then went to Paris where he became so fluent in Greek and Latin that he read Dioscorides in the original language. In 1530 he graduated in fine arts and medicine in Paris, returning to the Spain in 1536 where he taught at the University of Alcalá. He traveled to England, lived for a while in Holland, collecting herbs to verify Dioscorides prescriptions. From 1540-1545, he resided in Metz, Germany. There he was hired as a physician of the city. From 1545-1554 he lived in Rome where he received various honors from Popes Peter III and Julius III. 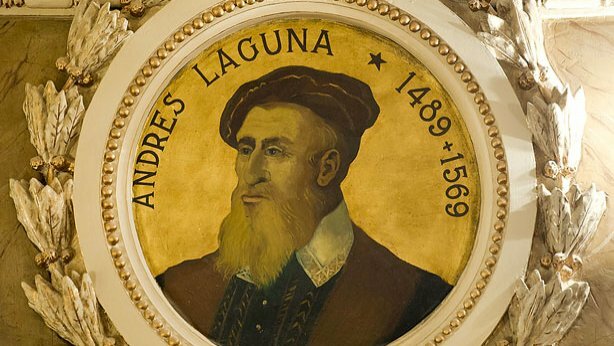 He spent time in the home of Ambassador Diego Hurtado de Mendoza, in Venice, who was a known humanist and owned of one of the best libraries in Europe of his time. After living in Holland again for three years, Laguna returned to Spain where he created the Botanical Garden of Aranjuez. It is thought that he died in Guadalajara in 1559. He is buried in the church of San Miguel, in Segovia. Put the spices in a bag. Put this in a pot with sugar and rosewater. Dissolve the saffron with a little rosewater and add it to the pot. Bring to a boil. Boil gently until the sugar has dissolved and a syrup is formed. Remove from heat. Grind the spices in the spice bag. Add 1 tsp or more, according to taste, of the spices to the syrup and set aside. 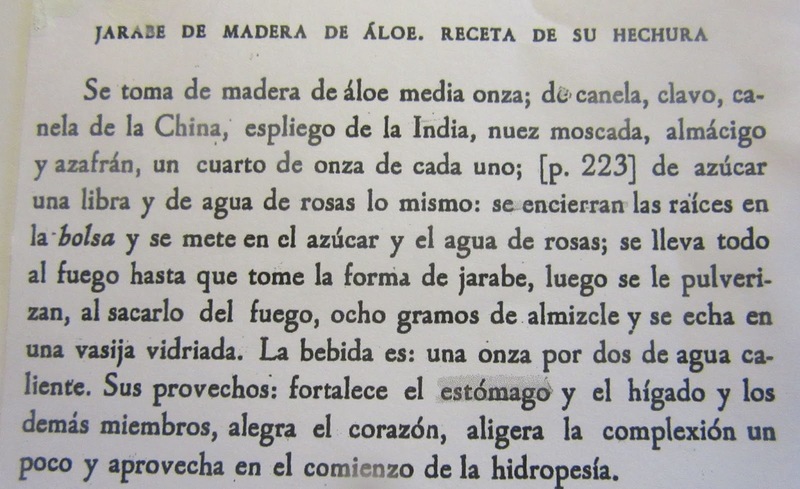 Wash an aloe leaf. Cut off both ends. Remove spine on both sides and put the leave in water for 5 minutes to help eliminate the yellow sap from the gel inside the leaf. 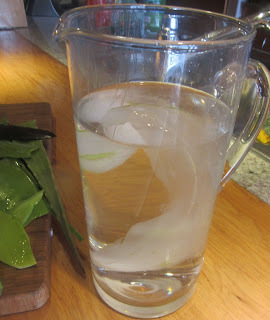 Remove the leaf from water, Take a blunt knife and remove the green outer coat of the leaf. Dip the leaf in pitcher with clean water to remove as much sap as possible. Put the aloe in a blender with the syrup. Turn the blender on low for 5 seconds and then high for 5 seconds. 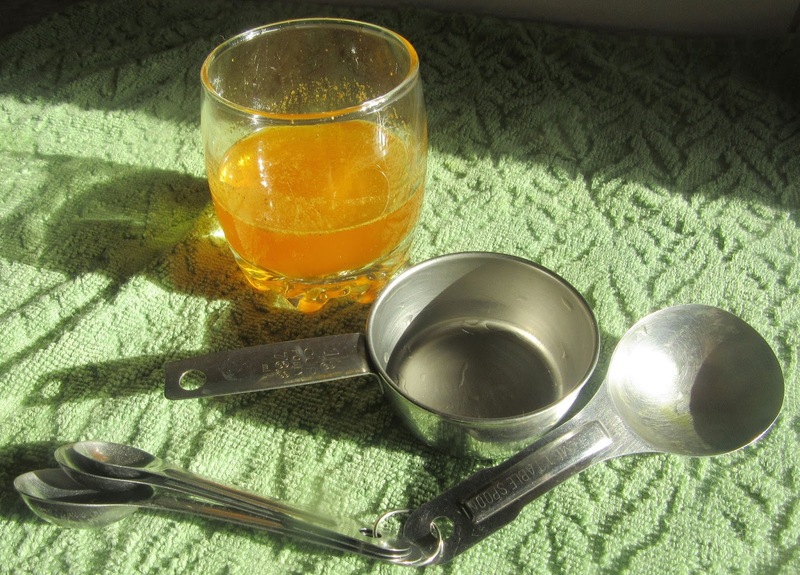 Drink 2 tbsp of the liquid mixed with 1/4 c hot water. The benefits: it fortifies the stomach, liver and other organs; it cheers the heart and tempers the complexion and is beneficial in the beginning stages of dropsy. Although the recipe is much older than Laguna, this is the type of recipe he could have prescribed. Musk was not used as it was not available. Further, it is very expensive.